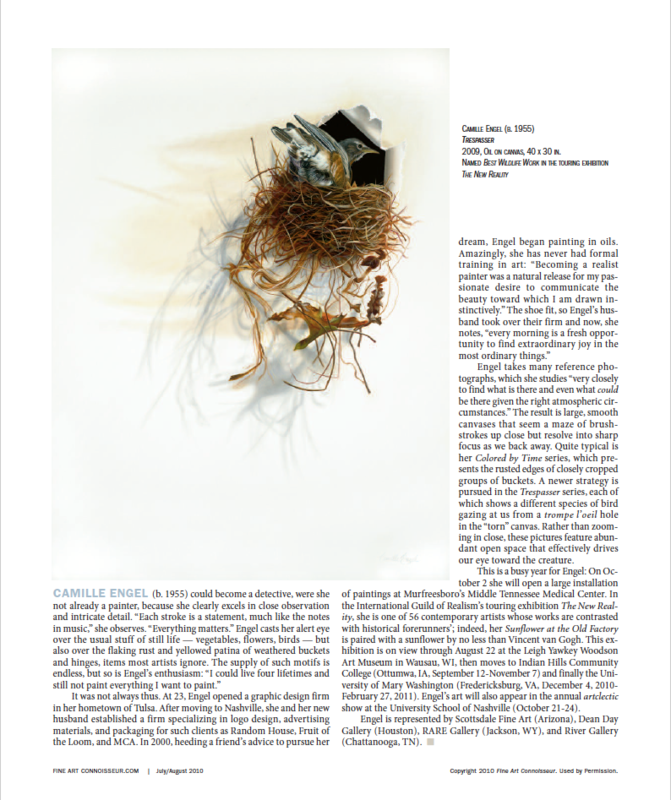 We are thrilled that Southwest Art magazine chose Camille Engel as their “Artist to Watch!” You can see the full article in the January 2014 issue. 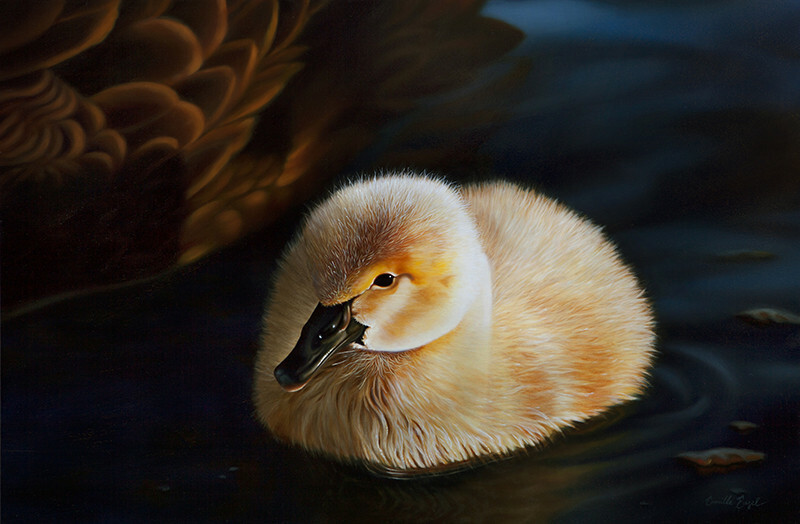 Camille Engel's 24" x 36" oil painting of a black swan cygnet, “Morning Glory,” is awarded the “Best Wildlife” ribbon at the 8th Annual International Guild of Realism exhibition at the Tempe Center for the Arts. This is the eighth straight year one or more Engel paintings have been selected for this important juried exhibition. "Winning this prestigious award is a high honor indeed!" said Camille, "Because the Tempe Center for the Arts is a large museum gallery, it is the largest exhibition for IGOR to date. The competition was extremely difficult for the jurors to choose the winners due to the large number of great entries and the immense talent from the applicants." 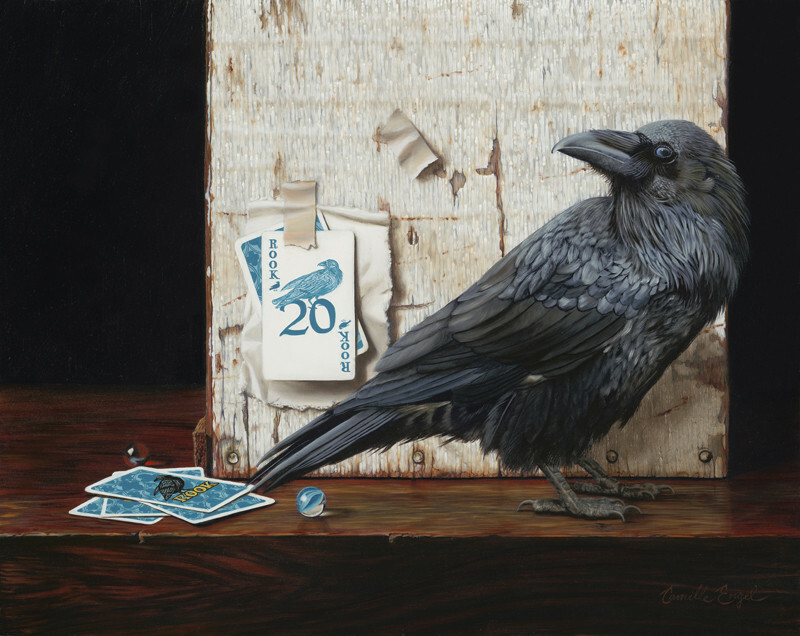 2013 Southwest Art Magazine selects "Strike A Pose" as "Top 75"
Southwest Art Magazine has selected "Strike A Pose" among their “Top 75,” in the magazine's “Artistic Excellence” competition. 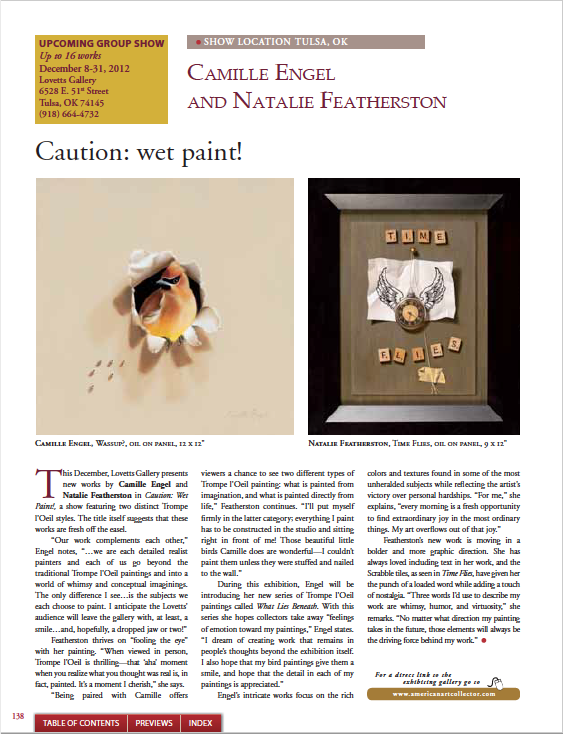 We are thrilled that American Art Collector chose Camille Engel as one of the artists in their ”Caution: Wet Paint!” article. See the full article in the October 2012 issue. 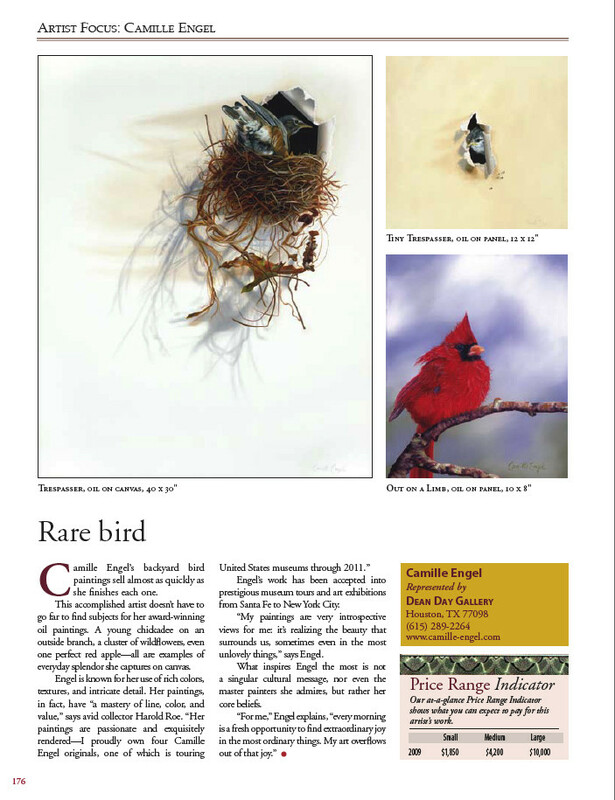 We are thrilled that Southwest Art magazine chose Camille Engel as one of the artists for their ”Art Values” article. See the full article in the January 2010 issue. 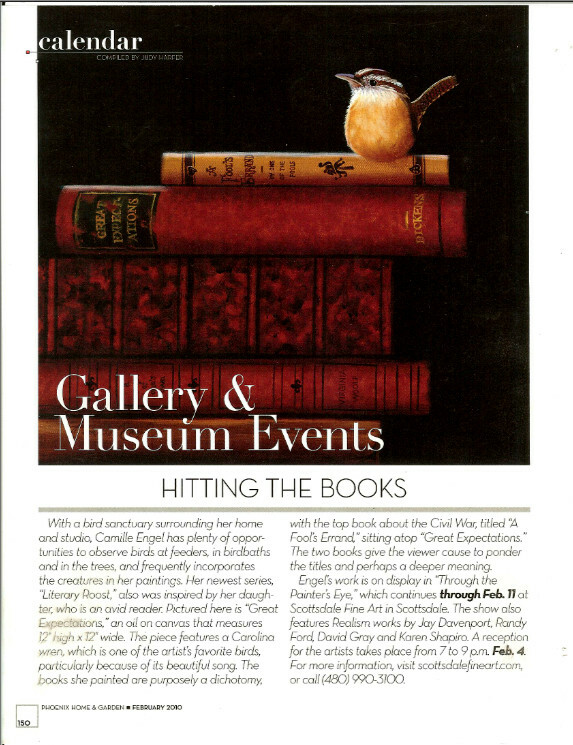 2010 "Fine Art Connoisseur" Magazine Names Camille Engel as One of Our Nations Top 3 Artists to Watch! We are VERY excited and honored by this great FULL PAGE coverage received in the February 2010 issue of "Phoenix Home and Garden" Magazine for the February Realism art show at Scottsdale Fine Art. The article, "Hitting the Books" Features Engel's Painting from her Literary Roost series of paintings. The Literary Roost series of paintings is inspired by and dedicated to Camille's daughter, Audry Camille Engel-Beckett, an avid reader and aspiring Opera Singer. 2009 “The Old Factory Sunflower” in American Art Collector magazine and accepted into Oil Painters of America Eastern Regional! 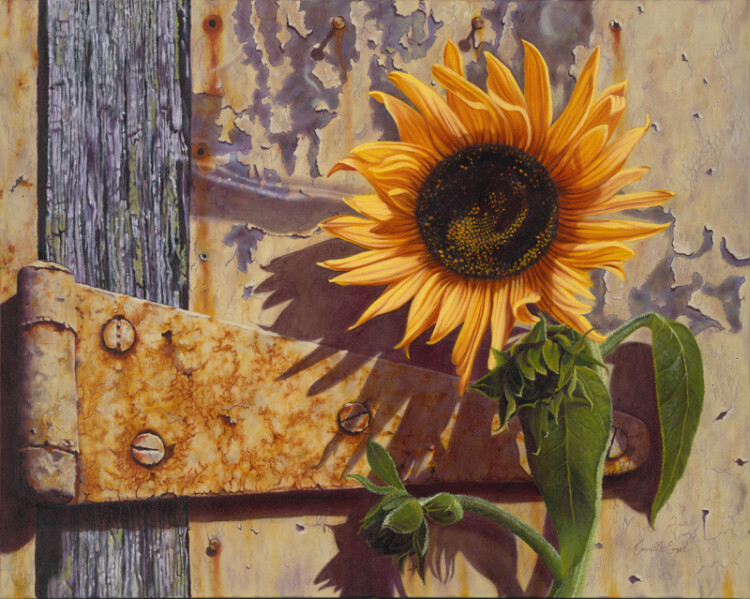 Camille Engel’s painting, “The Old Factory Sunflower” is accepted into the Oil Painter’s of America Eastern Regional! The American Art Collector magazine features an article on the Oil Painter’s of America Eastern Regional. Camille is excited that her painting, The Old Factory Sunflower, is one of the paintings featured in the article along with a two paragraph quote. An Artist Focus article published about Camille Engel in the September 2009 issue of American Art Collector Magazine.